Breaking through doors, taking money from innocent NPCs, and stealing cakes from stalls, what more could you want from a skill? Released in May of 2002, Thieving has become a popular choice for members in Old School Runescape, and a relatively quick 99. 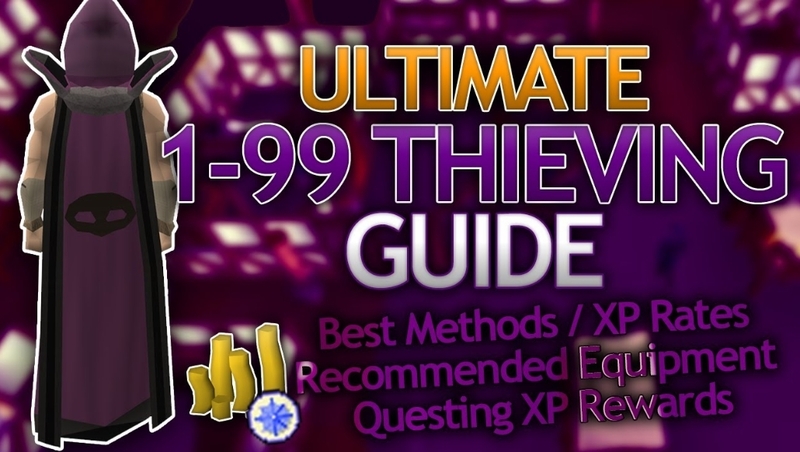 Put on your masks and get ready to thieve, as we go through not only the fastest way to 99 thieving, but also the most profitable! Feel free to rotate through the methods in this OSRS Thieving Guide, especially towards the later levels. Before we get into the OSRS thieving guide, we’d like to mention the importance of questing. The early levels of thieving can be quite tedious and click intensive, so we suggest completing a few quests that provide a decent amount of thieving experience to zoom through the early stages. 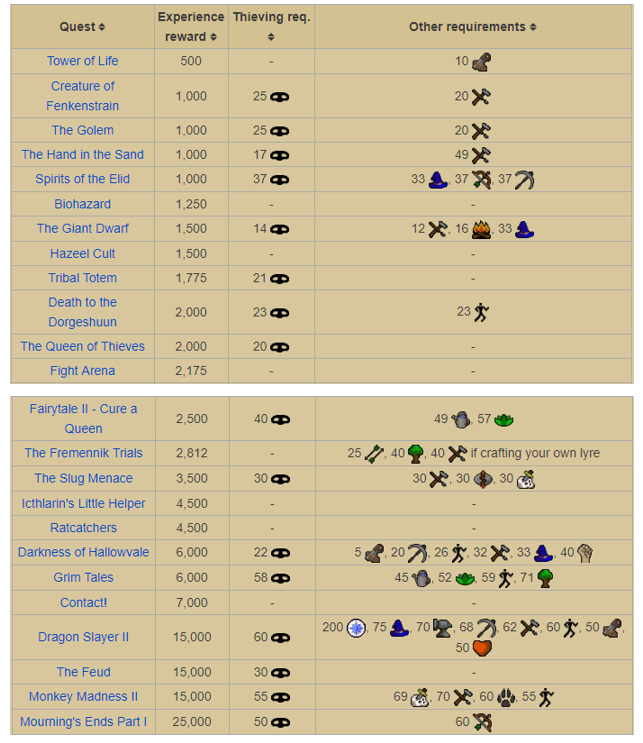 Here’s the list of all OSRS quests that provide thieving experience. To help you along your Thieving journey, here’s a few items we strongly recommend, as they provide exceptional benefits. This enchanted opal necklace, while equipped, gives you a 25% chance of not being stunned and damaged while pickpocketing any NPC. This helps you tremendously while pickpocketing and speeds up the experience rates. The necklace has 10 charges, and each charge is consumed every time you are saved from a stun. With basic math, the necklace an provide you with immunity from being stunned for up to a minute. You can get these special Cloaks after the completion of any Ardougne diary. 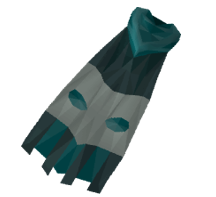 The first tier, the Ardougne Cloak 1, after completing the Ardougne easy diaries, provides you with a 10% increased chance to successfully thieve from stalls in Ardougne. The second tier, after completing the medium diaries, stacks with the easy diary and provides an additional 10% increased chance to pickpocket in Ardougne (even if your cloak is not equipped). The third tier, after completing the hard diaries, stacks with the previous diaries, and provides you with a 10% increased chance of succeeding when pickpocketing around Gielinor (even when not equipped). The last tier, the Ardougne Cloak 4, does not provide any additional thieving benefits. You can get these cloaks from Two Pints, in the Flying Horse Inn, in East Ardougne. To find rogue equipment, you’ll need to open rouge’s equipment crates, which can be attained by completing the Rouge’s Den minigame. On top of being a slick and cool outfit, the complete rouge outfit provides the chance of pickpocketing double the loot from an NPC. We heavily recommend this if you’re going to go down the road of the profitable section of this guide. From levels 1-55, the methods are the exact same for both routes you can take in Thieving. To kick off your thieving journey, and this OSRS thieving guide, you’ll start by pickpocketing Men & Women until level 5. You’ll find men & women practically anywhere, but they’re in a large abundance in areas such as Lumbridge and Edgeville. You’ll only be there for a few minutes, so don’t get comfortable. Quick tip for when you are pickpocketing – head to your settings, go to the ‘game controller’ icon at the top right, and select ‘Hidden’ under ‘NPC Attack Options.’ Doing this, makes pickpocketing so much easier, as your default left click option will be to pickpocket, not to attack. From levels 5 to 20, you’ll be stealing from the Cake Stall in East Ardougne market. More specifically, you’ll find the cake stall (otherwise known as the Baker’s stall) in the east side of the market. To optimally thieve them, stand opposite of the side which faces the market, and click away! Once you’ve got a full inventory, drop it (or bank) and carry on thieving. If in the rare instance you get attacked by a guard, you can either run away, or be brave and fight him. Either way, you’ll be right back to thieving very shortly. Best of all, you’ll only be here for about 20 minutes. Right next to the cake stalls, which you would’ve thieved from levels 5 to 20, is the Silk Stall, where you’ll be from level 20 through to level 25. 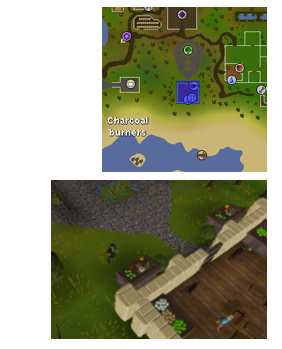 There’re two silks stalls in the East Ardougne market, and we’ve provided you a labelled map of each of them. Just like with the cake stalls, to efficiently thieve these stalls, simply stand opposite of the side of the stall which faces the market and keep thieving. And if you’re looking for some extra cash while you do this, you could sell the silk to the merchants. 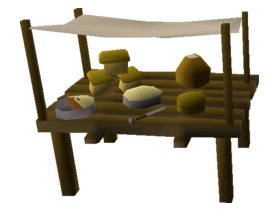 From levels 25 to 45, you’ll be stealing fruit from the Hosidius Fruit Stall in the Great Kourend. More specifically, the location is in the southside of the Hosidius house, near the beach. To do this however, you’ll need 15% favor from the Hosidius House, which is extremely easy to get. Also, while you’re thieving, you’ll notice two angry guard dogs, ready to attack you at any moment. 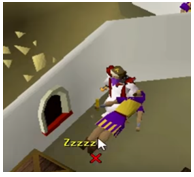 To avoid them, and make your thieving experience a bit easier, simply attack them, run into the building adjacent, and lock them inside the house (as shown on the picture). In fact, you’ll now be able to thieve the fruit stall with a 100% success rate. If you do choose to bank your thieved items, there is a bank slightly northeast. We’re finally getting into the heart of this OSRS thieving guide. 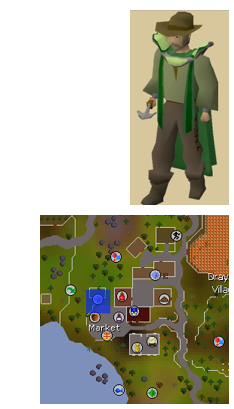 Get used to blackjacking, especially if you chose to take the fast route of thieving. 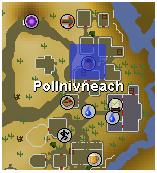 From levels 45 to 55, you’ll be heading to Pollnivneach, to blackjack the Bearded Pollnivnian Bandits. To blackjack, in a basic way, you’ve got to have equipped a blackjack (preferably a maple blackjack). Once you’ve found a Bearded Bandit, simply knock him down with the blackjack, pickpocket him while he’s unconscious on the floor, and wait until he stands up again. If you’ve got fast fingers, you can pickpocket him twice while he’s on the floor, for even more experience and gold. However, if you are caught trying to blackjack the bandit, he will hit you for 4hp. If you’ve been hit, simply repeatedly attempt to knock them back, and they’ll eventually be unconscious again. If you were too slow to knock them down once, they’ve hit you, they’ll start attacking you. If that happens, simply run away, regain your health and return. And if you’re in a house, you can just run up the stairs and wait a few seconds. Our personal favorite place to blackjack all types of bandits, is Ali the Dyer’s house, which is on the north side of Pollnivneach. The reason you’ll want to use this house, is because it is extremely small, and has quick access to escape ladders. If you do ever run out of food, and plan to stay for longer, there is a Banknote exchange merchant slightly west, and we’ve provided you his location on the map. Simply trade him some noted food, along with a few coins, and he’ll un-note them for you, so you can carry on blackjacking. If you don’t want to bring food, Ali the Barman, slightly south, sells wines for 1gp each. Simply do this method until 55, and you’ll have a few hundred thousand gold as well! In this OSRS thieving guide, you’ve got two options to choose from. You can either zoom through the whole skill, but you won’t be making anything significant. Or, you could take the other route, and make heaps of cash at slower exp rates. Just like from levels 45-55 where you where blackjacking bearded bandits, we’ll be doing the same thing from levels 55 to 65, but instead – you’re going to be blackjacking non-bearded bandits. They’re still in the same location, and you’ll be blackjacking them with the same technique as shown previously. To distinguish between bearded and non-bearded bandits, other than the obvious facial hair, look at their hand to see if they are carrying a weapon. All bearded bandits will not be carrying a scimitar, while non-bearded bandits will be carrying a scimitar. Best of all, you’ll be getting even more experience per hour, and even more gold per hour! And once again, we’ll be blackjacking from level 65 to 91. This time, it’ll be Menaphite Thugs. You’ll find these level 55s on the south side of Pollnivneach, and they’re hard to miss! The technique to blackjack them is the exact same as before. Except this time, you’ll be getting much more experience and gold! And according to player experience, they get much easier to blackjack at about 77 thieving, which isn’t too far down the road. To end off your OSRS Thieving journey, you’ll be completing the Pyramid Plunder minigame from levels 91 through all the way to 99. For this method, you’ll be in the Jalsavrah Pyramid, in Sophanem, which is unlocked after starting the Icthlarin’s Little Helper quest. Otherwise, you can simply use the teleport function of the Pharaoh’s Sceptre to get straight there. Also, we recommend completing the quest ‘Contact!’ for easy bank access next to the pyramid. If you haven’t completed ‘Contact!’ your next bank will be in Nardah, which is quite a tedious walk to do every time you need food or anti-poison. For the most efficiency, we recommend bringing weight reducing gear, as well as prayer potions, antidotes, food, coins and stamina (or energy) potions. And for an added incentive, there’s a 1 in 1000 chance of receiving a Pharaoh’s Sceptre, which is an extremely sought-after valuable drop! Unfortunately, in this guide we will not be breaking down the details of Pyramid Plunder, and the steps to complete it, as there is too much to cover for an OSRS Thieving Guide. However, if you do find yourself to be stuck while completing Pyramid Plunder, feel free to check the extensive guide on the Runescape Wiki Page, or browse around Youtube. To kick off the money-making guide to thieving, you’ll be pickpocketing Knights of Ardougne, in East Ardougne, and making some money in the process! To start pickpocketing these knights, first head to world 378, which is considered to be the unofficial “official” world for pickpocketing Knights of Ardougne. Hopefully, once you’re there, you’ll be accompanied by a multitude of players, who will make your thieving journey that much easier. There’re two places where you could thieve Ardougne Knights: the south-eastern part of the market, as well as the southern bank. To thieve the knights, it’s as simple as clicking on them, opening up your money bags every 28 successful pickpockets, and repeat! Scroll up to the very first method in this guide, for a handy tip to pickpocket efficiently. Scroll up to the ‘Fast’ section of this guide and follow those exact steps. You won’t be gaining as much experience as you would usually be, but you’ll still make a lot of money! Now, to end off the OSRS thieving guide, the money will really start to come in, as you Pickpocket Master Farmers in Draynor Village. These farmers will give you an exceptional amount of seeds, such as ranarrs and snapdragons! To soar into the range of over a million gp per hour, we extremely recommend having the rouge’s outfit for this. Also, if you’ve got a seed box, that’ll be very helpful. If you’ve got a low hit points level, make sure you bring some food (if you’re level 94 with the rouge’s outfit, don’t worry about food!). With your items, head to Draynor, and find Martin, the master gardener, as we’ve shown on the map. For the best efficiency (skip this if you don’t mind Martin running around everywhere), wait until Martin is trapped inside the pig pin. From here, simply pickpocket away, and drop the worthless seeds! And once again, scroll up to the very first method in this guide for a handy tip on pickpocketing! And there you have it – our OSRS Thieving Guide. You’re now on your way to become a master thief in Old School Runescape! Good luck on your journey, let us know how it goes!